Driza's House i Prizren, Kosovo: Bestill nå! We would like to welcome you to 'Driza's House', our 300 year old family house, not as a random traveler but as a dear guest of the Driza family. After renovating the typical oriental-styled Prizren house, located in the very city center of Prizren, into a modern Hostel, we opened in summer 2015 for guests from abroad. We are just minutes away from pretty much all attractive places of the city; including the river Lumbardhi, “Lidhja e Prizrenit” house, the City Castle, the Old Turkish Hamam, the old Cinema 'Lumbardhi', Sinan Pasha Mosque, Catholic Churches, Orthodox Churches, the famous Stone Bridge, Blue Bridge of Love, city’s main kebab houses, restaurants, bars and more. But even though all this is very close, located in a sunny backyard, the hostel is a quiet place to chill out and sleep well. So fare, the house has 2 shared rooms, one has 10, the other one 6 bunk beds. Every bed has it's own locker, a curtain for some privacy, reading lights and a electrical plug. We have a recreational space, with a little bar and some sofas, to relax and socialize with others. There is a front yard with tables to rest outside, orange juice and fresh coffee all day, 3 shared bathrooms, and WiFi. The included breakfast provides you with traditional food from the best bakeries around. 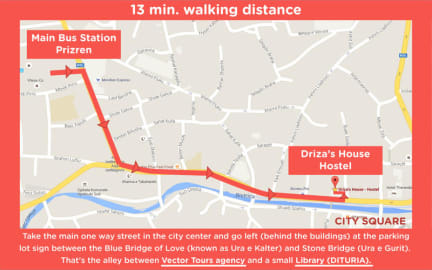 To find us, you take the main one way street in the city center and go left at the parking lot sign between the Blue Bridge of Love (known as Ura e Kalter) and Stone Bridge (Ura e Gurit). That's the alley between Vector Tours agency and a small Library (DITURIA). The Hostel is only a 15-20 minutes walk from the Prizren Bus Station along the main city road. With a taxi or city urban bus is not more than 5 minutes from the Bus Station. For more information's you can check out our homepage www.drizas-house.com. We hope to welcome you soon as a guest of the Driza family. Our working hours are from 7:00 AM till 22:00 PM. Unfortunately we don't have a private room yet. Soon the second floor will be renovated too and then we will be able to provide space for families or people with a higher privacy need. Children under 16 years can only stay here in company of adults. We are a pet friendly and non smoking house. Except for these conditions there are so far no other condition that we require.